The shale gas revolution in the United States promises not only to soon make the country energy self- sufficient but also serve as the catalyst for a major revival of manufacturing. Similar high hopes have been raised for Latin America, where some of the planet’s largest reserves of shale gas are found. According to U.S. Energy Information Administration estimates, Argentina is said to have the world’s second largest reserves of technically recoverable shale gas (China is first). The United States is currently in fourth place, followed by Canada and Mexico. Brazil is in tenth place, with Chile and Paraguay not far behind. The possibility that Latin America can pursue a successful shale gas strategy, however, is tempered by a number of important legal and/or geological differences that can serve as important bottlenecks. In addition, the region’s tumultuous politics often get in the way of implementing policies that boost investment and encourage a highly productive energy sector. The most important legal difference is that subsoil rights belong to the above ground property owner in the United States, while everywhere else in the Western Hemisphere the government (national, state or provincial) is the owner. Developers have had an easier time purchasing access to shale gas deposits from individual landowners throughout the United States. This explains, in great measure, why Canada’s significant shale gas reserves have not been as extensively exploited as in the United States, despite a hydrocarbons regime receptive to private-sector investment. 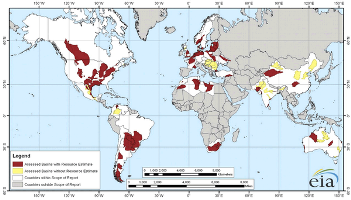 In addition, environmental protection legislation that impacts the shale gas industry is fractured among Federal, state, and local government authorities in the U.S. That has facilitated developers extracting waivers and more lenient treatment in the United States that would be harder to obtain in most Latin American nations, where environmental protection is the exclusive or predominant prerogative of the central government. Furthermore, current technology for extracting natural gas from shale reserves demands huge amounts of water, a resource that is scarce in those regions of Mexico, for example, where most of its extensive shale gas reserves are located. Political realities are the most crucial (and often overlooked) factor that can easily undermine any effort to develop Latin America’s extensive shale gas reserves. On paper, Argentina should be a regional energy powerhouse, supplying not only its own energy needs but those of its neighbors. However, the country has for years pursued policies that have scared off private-sector investment, heightened Argentine dependence on foreign energy imports, and led to a steady hemorrhaging of hard currency reserves. To outsiders these policies appear illogical, but they make perfect sense to Argentine political leaders trying to consolidate their power base. Mexico is an example of a country constrained by its Constitution from developing its extensive off-shore hydrocarbon resources. Any political party that tries to make major amendments to those constitutional provisions, however, risks annihilation at the polls. Brazil’s recent adoption of nationalistic legislation to encourage the domestic manufacturing of hydrocarbon-related technology could well impede exploiting its shale gas reserves if similar mandates are created for the highly specialized and capital-intensive hydrofracking equipment the industry utilizes. In fact the only Latin American country where the stars seem aligned to repeat the U.S. shale gas success story is investor-friendly, politically-stable, energy-starved, and free-market oriented Chile, whose shale gas reserves are concentrated in the remote, under populated (and very wet) far south of the country that desperately seeks new opportunities to promote local economic development. *Thomas Andrew O’Keefe is the President of San Francisco based Mercosur Consulting Group, Ltd. and teaches at Stanford University. Tagged Argentina, Brazil, Canada, Chile, China, Economic Development, Energy, Environmental Issues, Mexico, Paraguay, Shale Gas, U.S.A.
Costa Rica: Losing Faith in Democratic Institutions? Very interesting, Tom. Thanks for contributing this. I would be interested in your sense, and that of other readers of the blog, about several questions. First, to what extent might domestic political dynamics in both Argentina and Mexico turn out to minimize the obstacles to shale exploitation that you outline, and that I sense are insufficiently understood in much of the mainstream discussion of the issue. On the one hand, keep in mind that it appears likely that there will soon be a “relevo” in Argentine Peronism, with Cristina Fernandez de Kirchner replaced by a successor whose stance vis a vis international capital is uncertain (but likely to shift somewhat in the direction of peace-making), and who may face powerful domestic pressures to generate economic success that could be advanced through a shale-driven energy boom. At the same time, Pena Nieto’s efforts to open the energy sector to foreign investment (which is not the same as privatization, but that is a separate question) are hotly contested, as you note, but is it not conceivable that he trades off some constraints on investments in some traditional sub-sectors of the industry for opening to investment in shale? Second, just about everyone agrees that since the failure of FTAA the U.S. has lacked an agenda for meaningful engagement with South America on a shared economic agenda. That is among the main reasons that it each day becomes more irrelevant to the thinking of major countries about the region’s economic prospects. The most interesting response to this under Obama is the TPP, which regardless of what we may think of it may actually gain some traction as a strategy for restoring U.S. relevance. Is there a scenario under which cooperation around energy issues, including shale, becomes an additional basis for U.S. engagement, perhaps extending beyond the universe of TPP-inclined governments (e.g. Colombia, Chile, Mexico and Peru) to incorporate cases such as post-Cristina Argentina?. Finally, one more thing. About Chile, your account makes good sense, but just because Chile is energy starved and market-friendly doesn’t mean necessarily that a new Bachelet government will be able to impose what she and the Chilean private sector might prefer as solutions to the country’s energy crisis. My sense is that resistance from environmental movements in Chile could prove quite potent, dovetailing with social mobilizations around education and other issues, where hopes for “change we can believe in” will be major challenges to the new government. Assuming that Bachelet wins the presidency, it seems to me that she is going to face a lot of demands that won’t be easy to satisfy. How might this question enter into that overall dynamic? Although the Justicialista Party has historically been known for wide swings in the policy pendulum, it is doubtful that whoever succeeds Cristina Fernandez de Kirchner (and it will most likely be a fellow Justicialista, given the current disarray of the opposition parties in Argentina) will be able to make major changes in Argentine economic and energy policy quickly. For one thing, the free market policies of the Menem era still leave a bitter taste in most Argentine mouths and will continue to do so for many more years. In addition, quick restoration of consumer end rates for energy based on market prices is difficult because it will most impact on the pocket books of the Justicialista Party faithful. It is also inconceivable that any Argentine governmernt for the forseeable future will allow foreign multinationals to go it alone without some type of joint venture with YPF. Most private petroleum multinationals are generally not interested in such type of joint ventures. Chevron’s 1.24 billion shale deal has to be seen as part of a very long term strategy (when presumably natural gas prices will be higher than they are today and the political reality will have changed). The growing environmental movement in Chile is unlikely to detrimentally affect shale gas development. For one thing most of the country’s shale gas deposits are in the sparsely populated far south and would primarily be consumed locally during the region’s bitter cold winters. Hence, unlike the proposed hydroelectric dam projects in Aysen, there would not be massive destruction of pristine forests, lakes, rivers, and wildlife or the construction of hundreds of miles of hideous transmission lines through some of the world’s most beautiful scenery. Similarly, it would not involve the destruction of centuries-old glaciers in the Andes—as the Barrick gold mine project at Pascua-Lama proposes —that serves as the source of water for the fertile Huasco river valley upon which thousands of Chilean farm families rely on for sustenance. Secondly, finding new sources of energy is critical for maintaining existing jobs in Chile as well as creating new ones. The country’s energy prices are now considerably higher than in Peru. At the same time, Peru has dramatically improved its local business environment over the past decade so that it almost as competitive today as Chile. There is already anecdotal evidence of manufacturers directing their investments in favor of Peru over Chile because much cheaper Peruvian energy prices. I am just not convinced that there are enough Chilean environmentalists out there to overcome a much bigger majority that favor job creation.